fabric purchased on a recent trip to Kentucky. that she bought at an auction. Mildred Turner shows a Sunbonnet Sue quilt she finished for a member of her church group. Kara Smith showed a herring bone baby quilt. Lana's mother hand quilted this "Sunbonnet Sue". Lana started this quilt when she was 5 years old, her mother finished it and gave it to her after she got married. 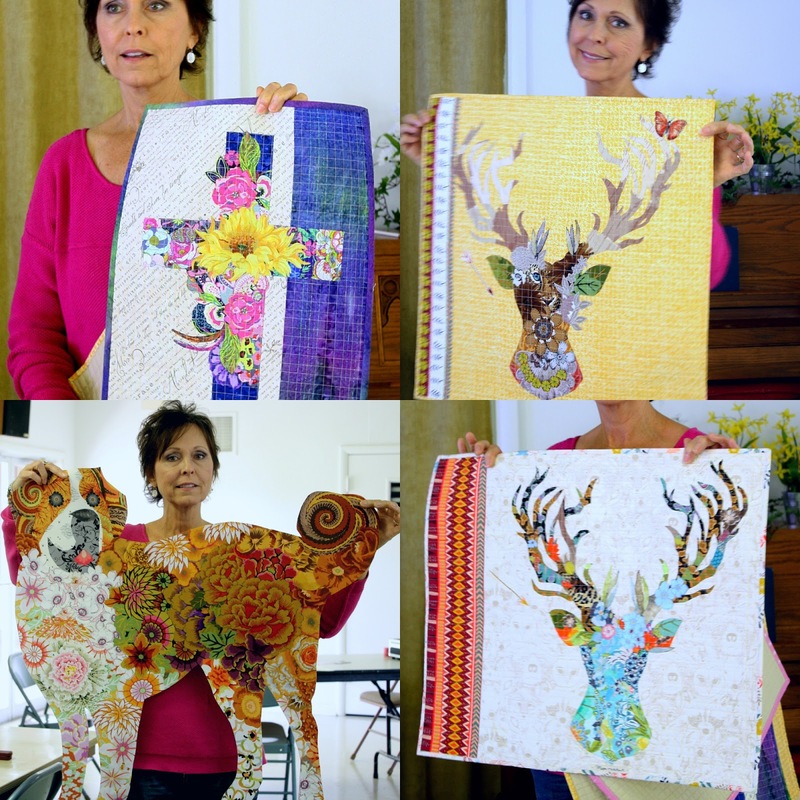 Joy Ivy shows her 1st hand quilting project. Vickie's first collage quilt was a kit bought from Fiberworks in Billings Momtana. She shares a few examples of her work from patterns she's designed..
Vickie explains the work process of the heart the class will do from the kits they were provided. Vickie demonstrates how to cut the flowers out. and applied to the background fabric. on the Lite Steam-a-Seam 2 so there is no waste. Looks like Joy has a yummy lunch under that plate! Thanks to all the ladies that brought irons, ironing boards and Teflon pressing sheets.